“Degas’s Place de la Concorde seems to draw from the operations of popular illustration more than other Impressionist paintings – in its willingness to make the politics of form a visible, rather than suppressed, text – even if it does so only obliquely, through placement, overlap, and erasure. As was first noted by Kirk Varnedoe, the black top hat of Viscount Ludovic-Napoleon Lepic…covers James Pradier’s late 1830s sculpture of the city of Strasbourg, so recently lost to the Prussians, along with Alsace and Lorraine. The statue functioned as THE site of national mourning for Parisians during the Siege of Strasbourg in September 1870, the long and difficult Siege of Paris that winter, and especially after the annexation of Alsace-Lorraine by the newly founded German Kaiserreich in the spring of 1871. It was permanently overwhelmed with wreaths, garlands, and flags, in a gesture uncannily echoing Degas’s placement of Lepic’s hat. Yet it has escaped observation how profoundly the hat marries other elements in the painting with similar political resonances: the accentuations of right and left; the tricolor bowtie of the figure on the left; Lepic’s red chest decoration that looks like the ribbon of the Legion d’Honneur. In the largely muted monochrome of the painting, these elements of bright color…stand out dramatically; they are meant to be noticed. The composition and sartorial choices are key to a full sociohistoric reading of the painting. …Reading Degas’s highly staged compositional devices from the viewpoint of its audience in about 1875, however, uncovers a range of new meanings for the painting. “The fortuitous covering of Strasbourg speaks to the inevitability of Lepic’s belonging to the wrong side of France’s political future. This fact could perhaps explain why he is in the painting to begin with and why Degas positioned him in such a precarious date with history itself. André Dombrowski, “History, Memory, and Instantaneity in Edgar Degas’s Place de la Concorde,” The Art Bulletin (June 2011), 195-97, 215. Nancy Forgione, “Everyday Life in Motion: The Art of Walking in Late-Nineteenth-Century Paris,” The Art Bulletin, vol. 87, no. 4 (December 2005): 671. In Albert Kostenevich’s publication of 1995, incorporating a report on the laboratory examination carried out on the painting for the Hermitage Museum, he notes most interestingly that at the lower edge a strip of painted canvas six or seven centimeters wide is folded behind the stretcher. Kostenevich indicates that this was done by the artist after the canvas had been trimmed, and quite a while after the painting was finished, since the paint was completely dray before being restretched. Meller, Mari Kálmán. 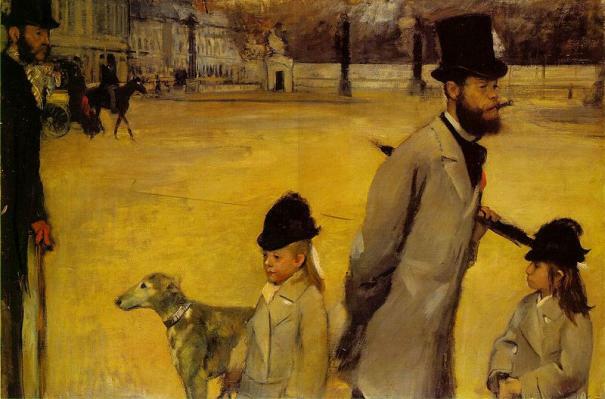 “Degas’s Place de la Concorde: Vicomte Lepic and His Daughters,” The Burlington Magazine, vol. 145, no. 1201 (April 2003): 273, 276, 277.